Starting off a bit slowly, Holloway uses the narration and point of view from Libbi to great effect: giving readers a solid sense of her character before the real action and tension start. I was curious about a Grim Reaper as a main character, this could easily have gone very dark and dreary, yet the story holds a hopeful, even positive feel despite the rather heavier content. Told in Libbi’s point of view, the first person narration (a difficult task to master) gives a true sense of the teenaged Libbi, her choices, her concerns and her heart. With a nice mix of interactions, interior thoughts and some terrific supporting characters, readers are drawn into the story as Libbi has to decide if she will help Aaron shed the mantle of Reaper by assuming it herself, dying as she should have in that accident. Aaron is wonderfully built, with his own set of conflicts and grief that he willingly shares: add in Libbi’s younger brother Max who is instantly engaging and Haley and Kyle who slowly grow into characters to appreciate. A full cast to fill out the story in this character-driven work. I had a few moments where suspension of disbelief just didn’t work- some plotting holes that were explained away, almost. And, I had some difficulty reconciling one character’s final actions with the personality and development of them to this point, which wasn’t so easily forgotten. I was hoping for some solid conclusions and end, yet that was just out of grasp with an ending that is mid-scene and high in tension. I’m not usually a huge complainer about cliffhangers, but this story, in and of itself deserved a solid conclusion. Narration in this story is provided by Kelly Collins Lintz, and this was my first encounter with this narrator. 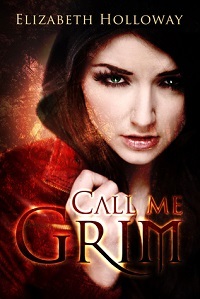 Her performance was spot-on, each character has a unique and distinct voice that fits their imagined selves, with delivery, pitch and pacing adjusted fractionally for each; making this an easy to follow narration and adding the right amount of emotional inflection to keep readers aware and interested. If you are looking for a natural-feeling, teen appropriate Grim Reaper tale, Elizabeth Holloway has created a story that, if you are patient and read through the slow start will provide many readers with a new favorite. The truck should have turned Libbi Piper into a Libbi Pancake - and it would have, too, if Aaron hadn't shown up and saved her life. The problem? Aaron's the local Grim Reaper - and he only saved Libbi's life because he needs someone to take over his job. Now, Libbi has two days to choose between dying like she was supposed to, or living a lonely life as Death Incarnate. Talk about a rock and a hard place. And the choice goes from hard to sucktastic when her best friend shows up marked: condemned as a future murderer. Libbi could have an extra week to stop the murder and fix the mark - but only if she accepts Aaron's job as Reaper, trapping herself in her crappy town forever, invisible and inaudible to everyone except the newly dead. But, if she refuses? Her best friend is headed straight for Hell.